When a hotel desk clerk on the graveyard shift uses the quiet time to learn the language of his ancestors, he embarks on a journey that takes him from New York to Phnom Penh and then Dallas. The result is the dreamlike “Knyum,” a one-man play by Vichet Chum having its world premiere at Merrimack Repertory Theatre in Lowell Jan. 10-Feb. 4. 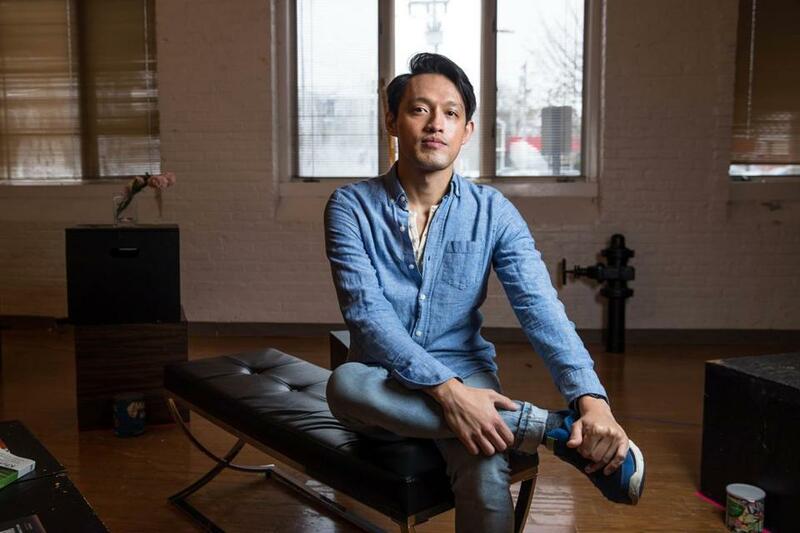 Chum, whose parents arrived in the United States from Cambodia after escaping the murderous regime of Pol Pot, grew up in Texas, steeped in the conflicting ideas of identity familiar to the children of immigrants from many different cultures. “Knyum,” the title of the play, means “I” in Khmer. Director KJ Sanchez, who is based in Austin, Texas, says MRT artistic director Sean Daniels approached her because of her experience directing new work, particularly her own memoir, “Highway 47,” about the town in New Mexico where she grew up and a feud that nearly destroyed the community. In the play, the character named Guy attempts to reconnect with his heritage by learning Khmer. As he struggles to find a connection to this foreign language, he remembers moments from his childhood, his fascination with novelist Amy Tan, the stories his parents told him, as well as the ones they did not, and begins to piece together a richer understanding of family and his place in it. Projections are an important piece of the production, says Sanchez. Designer Jon Haas has created a series of symbolic and literal images that provide an element of movement and story. Sanchez’s own theater company, American Records, focuses primarily on investigative and documentary theater, so she says the combination of facts and Chum’s quirky, funny voice make “Knyum” so accessible. The world premiere production represents a fulfillment of Daniels’s commitment to work that speaks to the people of Lowell, which is home to one of the largest Cambodian communities in the nation. The theater troupe Imaginary Beasts returns with its annual Winter Panto, a souped-up version of the traditional English theatrical form, at the Charlestown Working Theater Jan. 13-Feb. 4. This year, the company sifts Jules Verne’s “20,000 Leagues Under the Sea” through its comic, family-friendly strainer, with steam engines, sea monsters, Captain Nemo, and a talking cat all a part of this reimagining of the famous underwater adventure. Imaginary Beasts devises the script, working within the framework of the Panto, with its familiar stock characters, who often require encouragement (or jeers) from the audience to keep the action going. Under the artistic direction of Matthew Woods, the Beasts’ annual Winter Panto is a family favorite, and each year includes an unforgettable performance or comic line. Tickets $10-$24, 866-811-4111, www.imaginarybeasts.org.